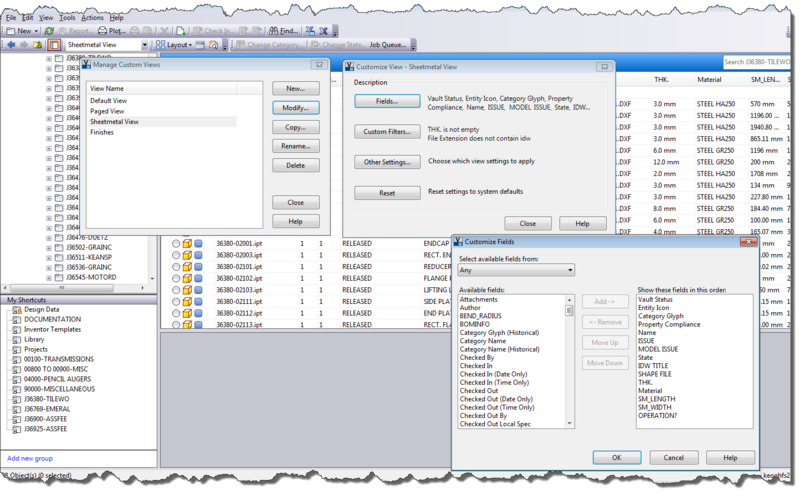 Brendan's Inventor Blog: Customise your Vault view. I've noticed the highlighted area on the above picture for many Vault releases and never really took the time to investigate it. But today I did and I'm glad for it. It's a method of filtering files based on a few settings, a bit like using Find but easier. For those like me (OCD) it's a simple method of filtering a folder full of data to just the data-set you want. In the below picture I have filtered a large folder on just the files that are Sheetmetal files, but not by the file type. I had to use a property based filter to limit the results to just what I wanted. 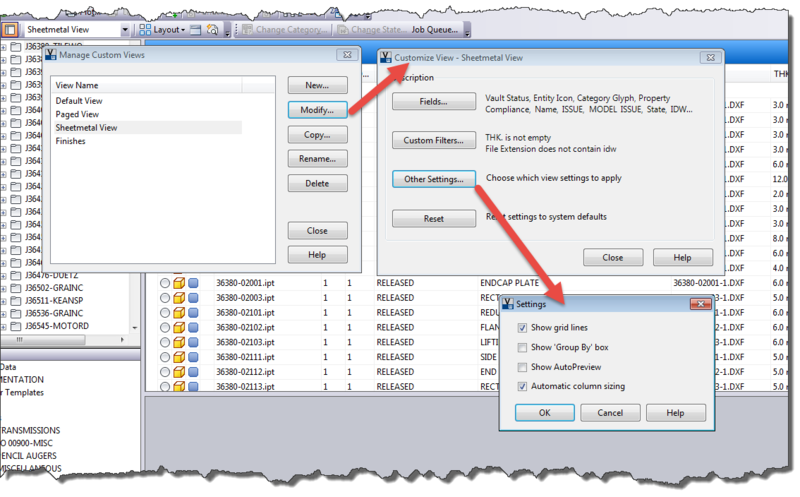 To make your own filtered data set you begin by selecting the drop down arrow to the right of the box (probably filled in with Default View) and then select 'Define Custom View's. Next click New and enter a name for your View and then hit OK. This then adds your view to the list. Now highlight your newly created view name and hit Modify. This brings up the 'Customise View - Your View Name' window. Here you can select the Fields you want to see on the view page as well as any Custom Filters you want to setup. In my example I created a view name of Sheetmetal and then added fields like Name, Issue, State, Shape file (which is the DXF file name in my world) and any others you want to see when this view is run. You can also re-order (move up or down) the field selections to suit your needs. Once you have the fields and order set hit OK and you are returned to the 'Customise Fields' window. Now hit 'Custom Filters' and this is where the magic happens. You have 2 tabs of 'Basic' and 'Advanced'. Choose the latter and use the 'Property' drop-down to bring up all of the properties available to add to the filter. In my example I'm creating a view to show the Sheetmetal parts. Unfortunately I can't just use File Extension because Sheetmetal and regular Parts use the same extension (.ipt). So instead I use a property that is only available to the Sheetmetal parts and that's Thickness, which in my Vault is THK. So I select THK. 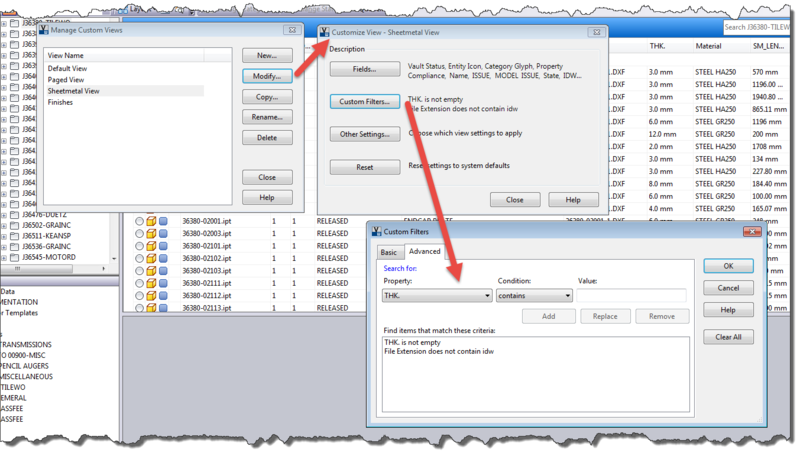 from the Property list and then select the Condition of 'is not' and I enter 'empty' into the Value box. This condition rules out all standard part files because for me Thickness is only created/populated when I create a Sheetmetal part. Additionally I also create another rule being the 'File Extension does not contain IDW' to also exclude the part IDW files which do have the Thickness iProperty. Once you have the Filter set hit OK to save it. Next hit the 'Other Settings' button to define the showing of grid lines and other miscellaneous stuff. Hit OK when you are done making your selections. Define more 'Custom Views' if you wish, otherwise hit Close to go back to the standard Vault Explorer window. Now test out your view. Select it in the drop-down box and see that it creates the filter as you specified it. You may need to go back and edit the view settings to get it exactly as you want. I certainly did. Now that you have created your Custom View sit back, have a brew and bask in your own glory. You've just made your life a little easier trying to find particular files which is very helpful when your Vault folder contains a lot of files. Instead of trawling through the files 1 by 1 you have a method of narrowing down the search candidates to just the filter settings you want. And IMO I think it's not as annoying as the Find feature.